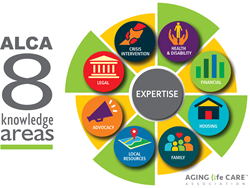 The Aging Life Care Association (ALCA) – the nonprofit association representing 2,000 leaders in Aging Life Care™ / geriatric care management – will celebrate the profession during the month of May. Special events come on the heels of a sold-out professional conference in New York, where presenters and participants tackled the toughest issues related to aging today. ALCA recognizes the vulnerable population our professionals serve, so we have developed the highest standards by which to hold our members accountable – for both the protection of the client and the public. Aging Life Care is a holistic, client-centered approach to caring for older adults or others facing health challenges. The Aging Life Care Professional is a health and human services specialist who is a guide, advocate, and resource for families caring for an older relative or disabled adult. Working with families, the expertise of Aging Life Care Professionals™ provides the answers at a time of uncertainty. Their guidance leads families to the actions and decisions that ensure quality care and an optimal life for those they love, thus reducing worry, stress and time off of work for family caregivers.